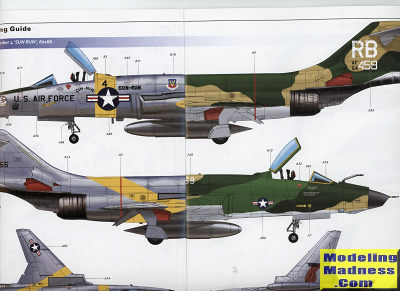 Twenty-nine surviving F-101As were converted to RF-101G specifications with a modified nose, housing reconnaissance cameras in place of cannons and radar. These served with the Air National Guard through 1972. Thirty-two F-101C aircraft were later converted for unarmed reconnaissance use under the RF-101H designation. They served with Air National Guard units until 1972. Kitty Hawk may well have saved the best for last. This is the only 1/48 single seat recce Voodoo kit to have been done and a most welcome presentation. If you have built any of their earlier F-101 kits, then this one will be quite familiar as the only real difference is in the forward fuselage/nose area. Those are where the camera housings are located. Once that is done, the wings and fin can be attached to the fuselage. On the fuselage are air scoop inserts and you have the option to have the speed brakes open or closed. This is when the rudder and horizontal stab are installed as is the tail hook. It is only halfway through the build that the cockpit is assembled. The kit has a four piece bang seat with p.e. harness. P.e is also used for the instrument panels and side consoles. These are fairly flat and some folks don't like them, preferring raised details i.e. 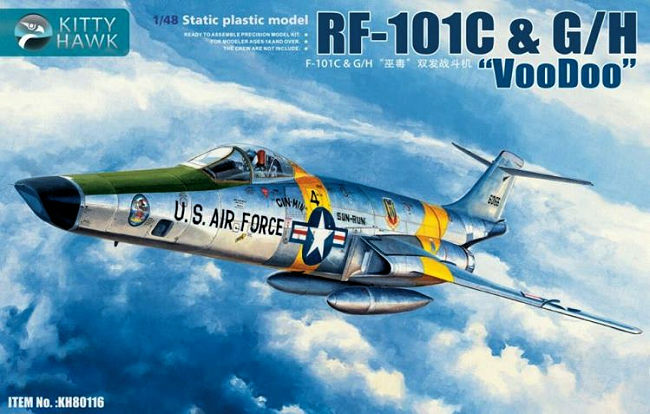 Monogram's F-101B. You have decals you can place over these if you wish. Kitty Hawk provides different forward nose sections for the C and the G/H along with four assembly steps per variation. It is here that you need to make up your mind as to which version you will be doing. There are no cameras so you basically paint the interior of the nose black. Unlike previous kits, there is nothing in the nose avionics bays either so those doors are cemented shut. A good place for weight, though I'm not sure if this will need it as the wheelbase is fairly long. This and the cockpit are then attached to the nose gear well. Again, instructions show the nose gear assembly being built up prior to closing the nose halves. The G/H version has an air refueling probe just forward of the windscreen and this can be modeled extended. The only items for under the wings are two fuel tanks as the recce birds were unarmed. Instructions are well done, though they don't beat you on the head when it comes time choose variants so I can see those who don't pay attention wanting to do the C starting in on the G/H before realizing it. 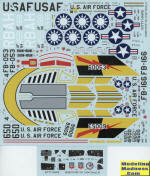 The decal sheet is very nicely done and provides five options. One is the 'Sun Run' box art plane in unpainted metal. All the yellow on this plane will need to be painted. Not the case with the other USAF unpainted metal plane, which is from the 15th TRS. All the yellow bits for this one are provided. Then there is another unca mouflaged plane as operated by the ROKAF. Then we have a camouflaged plane from the 45th TRS with the AH tail code and one RF-101G/H with an RB tail code with the 154th TRS, Arkansas ANG. 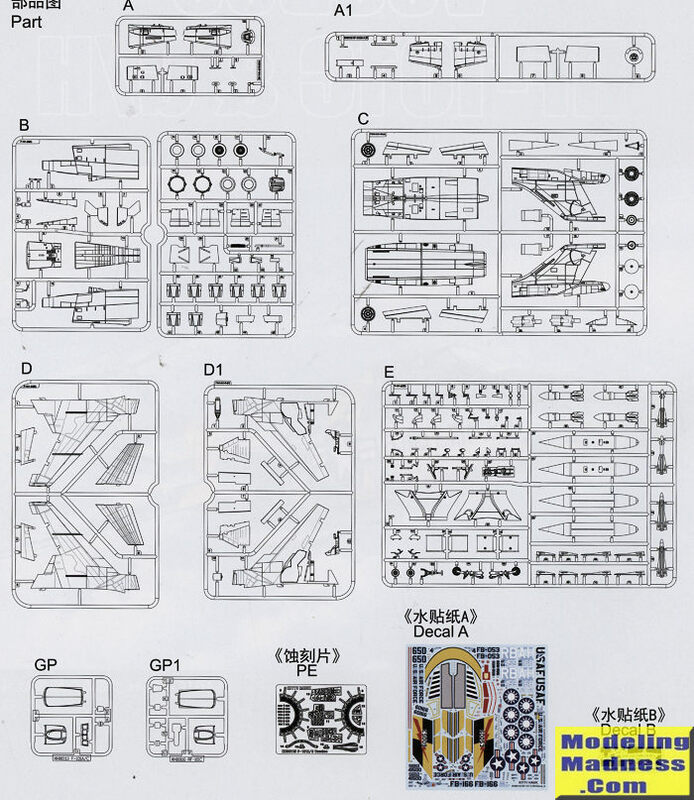 The instructions provide no unit information nor are the decal placement pages offering any color information for the camouflage schemes. In addition, someone at KH brain farted and printed all the decal placement pages as if they were the centerfold. It means that other than the center pages, all the others have one scheme on one side and one on the other. It looks confusing, but the builder can open the staples and remove the page that applies to the scheme they are using. 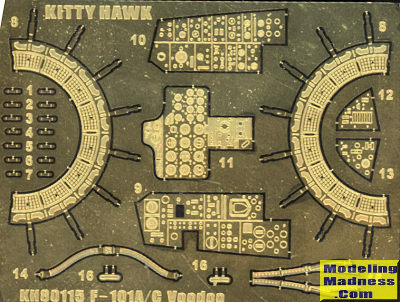 I think this may well complete the series Voodoo kits from Kitty Hawk. 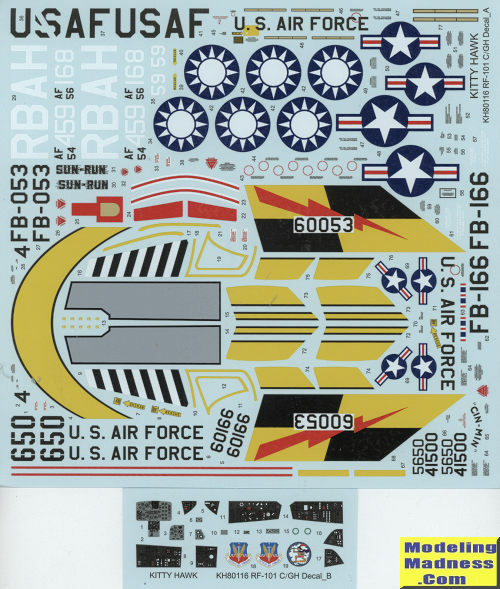 You can now build every version of this aircraft that saw service in 1/48 scale. 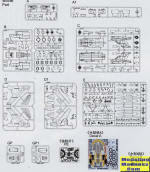 The kit is not a toss-together, but careful building will produce an excellent model. Well worth picking up. I am equally sure that the aftermarket folks will be producing stuff for this kit, if that sort of thing is what you like. Thanks to Kitty Hawk for the review copy. Get yours at your favorite retailer.